You are living in Stuttgart and want to improve your German skills while meeting new people? Then join my German Conversation Groups! We will talk about topics that are hot right now in Stuttgart and even go out to use our German on the streets, to test our skills on “real Germans” and to see what’s going on in town. From April 2019 onwards I will offer a B1&B2 group, a B2-C2 Group and individual Groups. Please note: We will not talk about grammar in the Conversation Group. It will be all about you losing your fear to speak in German and to finally become comfortable saying what’s on your mind without thinking too much about grammer rules. It is important for me to create a safe and fun atmosphere where everybody feels welcome and comfortable to use their German. I want to keep the groups small so there is a minimum number of participants of 4 and a maximum number of 6 people (please note that the session time might be reduced to one hour if only 3 or less people show up for a catch up). The catch ups will take place in a café or restaurant in downtown Stuttgart – or alternatively somewhere outside. I will start two new German Conversation Groups in April 2019. The group on Tuesday is designed for those of you who are at level B1 or B2 at the moment. The group on Wednesday is for all of you who are at B2 or higher. I am conscious and aware that not everyone might be available for every session. That’s why from April 2019 onwards I will be offering two different rates. You can decide personally which price model suits you best. When you book all 10 catch up sessions from April to June 2019 the price per session is reduced to only 13 Euro. That means the total price for the all-in rate is 130 Euro. When you know from the beginning that there are some dates you can’t join the group you can choose the flexible rate. For the flexible rate the individual session costs 15 Euro. The flexible rate requires you to book a minimum number of 5 sessions. Thus the total price of the flexible rate starts from 75 Euro (for 5 sessions). When you choose the flexible rate you are requested to advise which dates you would like to join the group at the time of booking. The rates include the 1.5 hour sessions (if 3 or less people show up a 1 hour session), all materials and one small soft drink when the catch ups take place at a restaurant or café. You are a small group of people (2 or more) who can’t make it to one of the groups named above or who would like to meet and speak German in private? In this case I can arrange an Individual Conversation Group for you. Please contact me via the form below and we can look for dates and times that suit you and I can provide you with an individual offer. This is exactly the German conversation course I have been looking for! I took this conversation course and simply loved the relaxed concept of gaining self confidence in talking German with no focus on grammar. Mel is very friendly and made me feel comfortable from day one. We also had some fun interaction games with local Germans! I recommend this course to anyone who wants to improve their level in German conversation. I liked the friendly and supportive atmosphere and learning more about the local area. 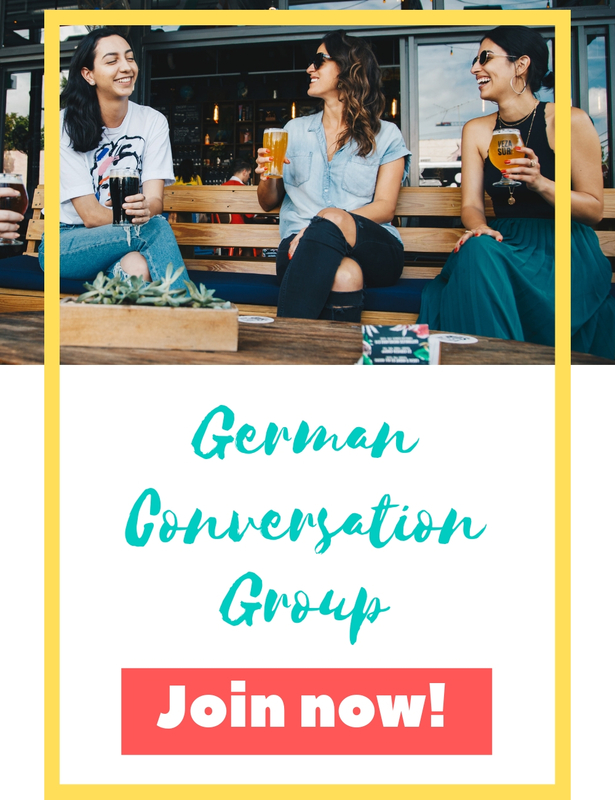 Sign up for the next German Conversation Group now! If you are interested in joining the German Conversation Group, please fill out the contact form below. You will receive further information about the terms and conditions as well as the methods of payment. If you choose the flexible rate, don’t forget to include the dates you would like to join the group in your message. Your place in the German Conversation Group is booked as soon as we receive your payment. If you are interested in joining the group but are not free on the dates mentioned above, please contact me via the form as well. I will save your contact details and get back to you as soon as I start a new group.